Why use technical analysis in conjunction with seasonal investing? 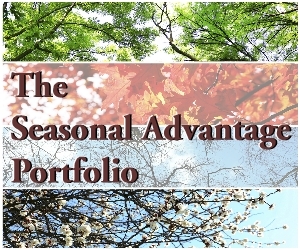 Seasonality analysis is a useful tool when looking at a general time to enter and exit equity markets and sectors. However, seasonality analysis is not precise. It only gives an approximate time when trades can be made. Equity markets and sectors rarely reach important lows and highs on the dates identified by seasonality studies. The solution is to use technical analysis to optimize seasonal entry and exit points. Normally, technical analysis will provide optimal entry and exit points within one month (plus or minus) of an identified period of seasonal strength. Net result: investment performance usually is enhanced significantly. Several well known momentum indicators are preferred for optimizing seasonal entry and exit points. They can be used separately or jointly. Choice of indicators is determined by experience and comfort of the investor. Short term momentum indicators based on daily data are preferred when seeking entry and exit points for seasonal strategies. Indicators using weekly data are useful as a supplement to indictors using daily data, but, by definition tend to be less precise for entry and exit. All use moving averages in one form or another when calculated. By definition, all will provide entry and exit signals shortly after a short term low or high has been reached. MACD is the best known and most widely used momentum indicator. Entry and exit points are determined by a cross over of two moving averages. A buy signal is given when the indicator is oversold (i.e. below -1.0) and a positive cross over occurs. Please refer to the enclosed chart for demonstration of a buy signal. Conversely, a sell signal occurs when the indicator is overbought (i.e. above 1.0) and a negative cross over occurs. MACD buy and sell signals are more relevant when divergence between the indicator and price of the security occurs on an intermediate basis. The enclosed chart gives a trend line showing divergence between the MACD indicator and the price of crude oil. MACD is the slowest and latest of the three momentum indicators. RSI and Stochastics are faster, but are more prone to false signals. RSI is slightly faster. When the indicator declines to 30% or lower, the security is oversold. The investor looks for a recovery above 30% for a recovery entry point. Conversely, when the indicator is above 70%, the security is overbought. The investor looks for weakness below 70% for confirmation of an exit point. Stochastics is the fastest momentum indicator. A drop below 20% indicates that the security is oversold in the short term. A recovery above 20% indicates a short term entry point. Conversely, a move above 80% indicates that the security is overbought in the short term. Weakness below 80% indicates a short term exit point. Bullish Percent Index is a useful indicator when used in conjunction with short term momentum indicators. Its strength is its unique method of calculation. Data for Bullish Percent Index does not include moving averages applied by other indicators. 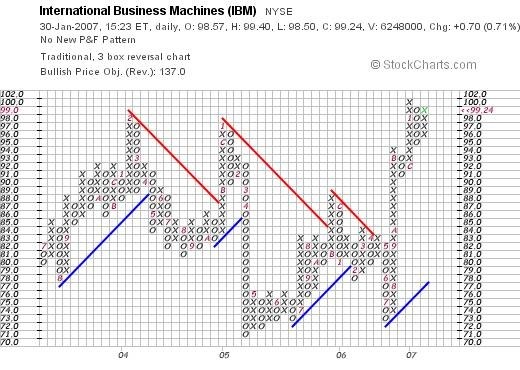 IBM is one stock out of 500 stocks in the S&P 500 Index that is considered to have an uptrend or “bullish” trend based on point and figure analysis. StockCharts.com adds up the total number of stocks in the 500 that have an uptrend and publishes the data as a Bullish Percent Index for the S&P 500 Index. Bullish Percent Index for the S&P 500 is updated daily and published at www.stockcharts.com at $BPSPX. Bullish Percent Indices are available for well known broadly based equity indices and U.S. sectors including the S&P 500 Index, The S&P 100 Index, the Dow Jones Industrial Average, the NASDAQ Composite Index, the NYSE Index, the NASDAQ 100 Index, the Dow Jones Transportation Average, the Dow Jones Utilities Average, the TSX Composite Index and the ten S&P sector indices. Bullish Percent Index works best for an index with a large number of holdings. For example, it works better for the 500 S&P 500 Index stocks than for the 30 Dow Jones Industrial Average stocks. The Bullish Percent Index based on a small number of securities tends to be more volatile (i.e. choppy) and prone to false signals. A 15 day moving average has been proven through experience to be a reliable “cross over” measure to confirm a change in trend on Bullish Percent Index charts. Trend lines are useful for confirming the direction that a chart is moving. They can provide early warning signs when direction is changing. However, they should not be used a “stand alone” buy or sell technical signal. By definition, a trend line needs three or more points to connect. For an uptrend, the three or more points are located below indicated prices. For a downtrend, the three points are more are located above indicated prices. Confirmed support and resistance levels often are useful for establishing trend lines. Following are examples. Moving averages can be considered as another form of trend line. They indicate a chart’s direction, but with more flexibility. The moving average most frequently used for longer term direction is the 200 day or 40 week moving average. Both averages are virtually the same. The 200 day moving average frequently acts as a support or resistance level. The 200 day moving average also is an attractive indictor for measuring risk and potential return. Assuming charts eventually revert to a neutral level determined by the 200 day moving average, the percent gain above or below the 200 day moving average can indicate amount of risk/potential return. The second moving average frequently used for medium term direction is the 50 day moving average. A break above the 50 day moving average is an “alert” signal to explore a possible buying opportunity. Conversely, a break below the 50 day moving average is an alert signal to explore a possible selling opportunity. Target prices are interesting, but not very useful. They frequently are provided by technical analysts as a guideline for potential return from an investment, fully realizing that targets should not be used as “hard numbers” for completing a transaction. A point gain (or loss) recorded in a previous trading range that is translated into a potential point gain (or loss) when support or resistance levels for the current trading range is broken. The percentage gain (or loss) recorded in a previous trading range that is translated into the potential percentage gain (or loss) when support or resistance levels for the current trading range is broken. The Philadelphia Semiconductor Index broke above confirmed resistance at 380.13. Previous trading range was 380.13 to 332.11. The later method is preferred. Whole Foods broke below confirmed support at $29.81. Previous trading range was $29.81 and $36.03. Lots of strange names: Head and Shoulders, double tops, double bottoms, rising wedges, saucers, rounding tops, V formations and spikes! All are major reversal patterns. Other names include triangles, diamonds, flags, pennants, wedges and rectangles. All are continuation patterns. Naming the patterns is an interesting exercise (particularly when talking with another technical analyst), but is not really necessary when determining an entry or exit point on a chart. When owning a trending investment, what size of a correction is reasonable before concerns about a change in trend are raised? Up-trending charts usually experience brief periods of weakness over time. Seasonal investors frequently will calculate their “tolerance” level where they will take protective measures when the investment weakens. Their tolerance level frequently is called “the box”. The seasonal investor will maintain the position unless the security drops out of the box. The box is established by calculating a retracement level based on the investment’s previous trading range. A retracement box is calculated on a percentage basis and usually is a range between 33% and 66%. (Investors focusing on a Fibinacci retracement will use 37.5% and 62.5%). Here is an example. Range Resources has been trending higher for an extended period of time. The trader wants to protect himself. He decides he will maintain the position during a short period of weakness as long as the stock remains above his “tolerance” level. The stock’s recent trading range has been between $56 and $74. Retracement “Box” for the stock is between $63 and $68. If the trader has a tight tolerance he may decide to place a stop loss order near the top of the box at $68. Another trader with a higher risk tolerance may be willing to place a stop loss order at the bottom of the box at $63. Both traders are out of the trade if the stock moves below $63. Volume is a useful tool when stocks are breaking confirmed support and resistance levels. A spike in volume on break outs and break downs usually confirms their significance. Chances of follow through in the short term are higher. Break outs and breakdowns on volume, when significant news is released, are particularly relevant. Cardinal Health is a good example. The company broke above a base building pattern on higher than average volume after reporting better than expected quarterly results. On Balance Volume is an interesting indicator that frequently is useful for identifying stocks that are under accumulation for a possible take out. The method for calculating On Balance Volume is relatively simple. Volume is added when price of the stock moves higher and volume is subtracted when price of the stock moves lower. The reason for the phenomenon is a tendency for acquirers of large stock positions to “sit in the weeds” with a “bid” just below the market and to take out the “ask” price only when a sizeable block of stock is offered. Net result: the On Balance Volume indicator moves higher during a time when price of the stock remains relatively flat. The On Balance Volume indicator is particularly useful when the indicator has moved to a new high just prior to a test of a key resistance level. The implication is that the acquirer may be ready to take the stock to the next higher price plateau. The indicator is less useful today than it was 20 years ago. Equity activity related to listed options transactions has skewed the data for actively traded stocks and ETFs. Denison Mines is an example of a stock with a positive On Balance Volume profile. Rumors of an eventual takeover of the company persist. On Balance Volume data indicates that the stock is under steady accumulation by a large buyer. Interesting, but not high on the seasonal investor’s radar screen”! Most people find Elliott Wave analysis difficult to grasp and somewhat intimidating. The principles behind the theory are relatively simple. They focus on patterns, ratios and time. However, interpreting Elliott frequently is more of an art than a science. If you put four Elliotticians in a room with one chart, chances are that at least three interpretations will be offered. To be fair, some Elliotticians have shown considerable skill over the years. The best example is Bob Prechter, the ultimate guru of Elliott Wave. More information is available through Bob’s company, Elliott Wave International. The four year stock market cycle usually is called the Four Year Presidential Cycle or the Four Year Economic Cycle. Historically, the four year cyclical low for the U.S. stock market has occurred within three months prior to the U.S. midterm election held during the second year after a president has been elected. On average, U.S. equity market advance thereafter for the next 22 months. The best period for performance by the S&P 500 Index during the four year cycle has been the nine month period following the four year low. The President uses his “political capital” to complete difficult items on his agenda during the first year of his mandate. His standings in the “popularity” polls diminish. The opposition party in Congress starts to raise concerns about the President’s actions early in the second year of his mandate. Plans to gain more seats in Congress during the mid term elections are prepared. Political rhetoric builds during late spring and summer. Congress is spending more time debating each other than considering legislation. Rhetoric raises concerns about economic activity. Growth in the U.S. economy starts to slow. Corporate revenues and profit margins come under pressure into the second and third quarters. The political agenda shifts, the president looks for ways to improve the economy prior to the end of his four year term, economic growth accelerates, corporate revenues and earnings improve and stock prices go higher. Less well known is the tendency by all major developed nations to complete a four year economic cycle that corresponds to the U.S. Presidential Cycle. Four year economic cycles and their corresponding four stock market cycles also occur in Canada, the United Kingdom, developed European countries and Japan. The four year stock market cycle has been exceptionally reliable for many decades. The U.S. stock market has recorded a four year low on 26 of the past 29 occasions since 1890. The only three occasions when the four year low was not identified just prior to the U.S. mid-term election were 1936, 1986 and 2006. On each occasion, the U.S. equity market continued to move higher without a correction of 5% or more. The miss in 1936 was followed by a substantial correction in 1937. The miss in 1986 was followed by a substantial correction in October 1987. The miss in 2006 was followed by a significant correction in late 2007/ early 2008.